The 2003 vintage has been highly-praised in some publications and it's been bashed in others. We have tasted some very curious wines from this hotter-than-hell vintage, while others have been magnificent. 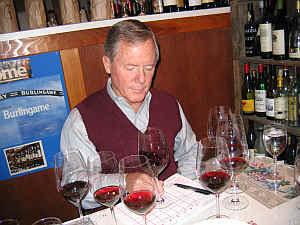 Our May 2006 tasting of Chteauneuf-du-Pape wines was delightful and most of the wines in that line-up were pretty good. 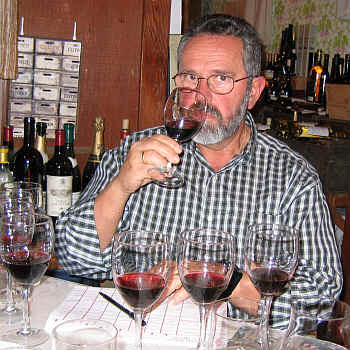 We looked forward to evaluating a second set of wines. The hugely hot temperatures proved a test for winemakers in the Rhne. The winter following the 2002 harvest was extremely wet. We read reports indicating the water table in Southern Rhne vineyards was high and, perhaps, a help in the crazed, global-warming vintage of 2003. It was a hot, hot summer. 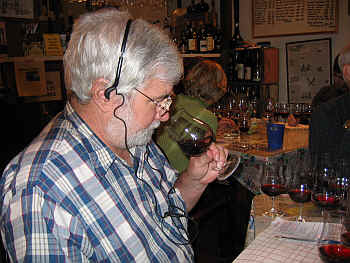 Grapes had a potential alcohol of 14 to 15 percent by the end of August, yet the fruit was not physiologically mature. 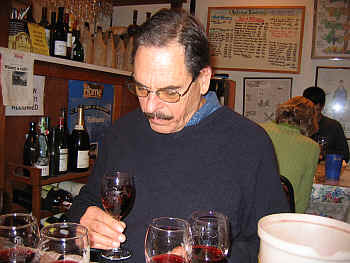 Managing the fruit in a manner allowing one to make healthy and balanced wine was quite a challenge. Two wines finished reasonably well ahead of the pack. One wine was a bit off the pace and while not flawed, it simply did not catch people's attention in this line-up. There is quite a range of price within this set of wines and, happily for consumers, the least costly wine won this tasting. Ellen was away this week, so she missed contributing her scores to the results. La Nerthe is a highly-respected property, so it was a bit of a surprise for this to finish last in our tasting. "Simple and grapey," said one critic. Another critic echoed this notion, saying "at least it tastes a bit of Chteauneuf-du-Pape." Someone else encountered "H2S which blew off. It shows stewed prunes and some volatility on the palate. It's sharp and flawed." Another taster noted this seemed to change a lot during the tasting. "Some sips were good and others were now." One panel member said "This is simply not a $40 bottle of wine." A final voice found "notes of grape skins, pomegranate and berry cobbler." This wine displayed a medium intense ruby color, with ripe berry aromas and notes of raspberry pie. It seemed either off-dry or a bit flat on the palate. Medium-bodied, the La Nerthe offers ripe berry fruit on the palate and a jammy quality. There's a modest level of tannin here, but the overall impression is a soft, ripe wine which is very superficial. It may cellar nicely for a few years, but I'm not sure if it will "grow" and develop any additional layers of complexity. It's a perfectly pleasant wine. I did not award this any "stars" on my three star scale, finding it to be a perfectly sound, but standard quality wine. One taster likened this to "a raspberryish, sweet, simple California Zinfandel." Another critic described the LeSec wine as "Uncharacteristically Port-like and over-ripe." Someone else felt it was "overly tannic," while a final taster said "It's astringent and has a hot finish." With a medium garnet color, I was put off by a nutty, Sherry-like note. Every time I took a sniff of this, I kept finding a note of oxidation which was bothersome. When I mentioned this as we were discussing the wine, a number of tasters picked up their glasses and agreed there was, indeed, a note reminiscent of Spanish Sherry. This element is not noticeable on the palate, though and the wine shows a more typical, classic character of Chteauneuf-du-Pape. There's a nice bit of spice and a tannic backbone. I might give this a one star rating, but would really like to taste another bottle to see if that Sherry-like note is, in fact, a part of this wine's make-up. Judgment reserved. One critic felt this wine had a lot of tannin from the stems, citing "green and sour notes in this over-ripe red wine." Someone else found "cherry and berry fruit with crisp acidity and fine tannins." 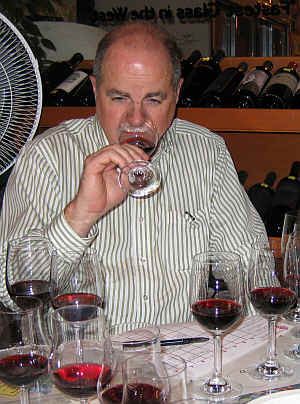 One panel member mentioned finding notes of "kirsch as the wine has elements reminding me of cherry liquor. It's rather tannic and seems to lack the appropriate level of fruit to go with it." Someone else found "sour, over-ripe notes and it's unpleasantly 'hot'." Another person found Beaurenard's wine to be "disappointing on the nose. It is better and more assertive on the palate, though." Medium ruby in color, the regular bottling from Beaurenard has some berry fruit and a cocoa powder note on the nose. There's a sense of ripeness here, certainly, but not so much as to be jammy. The wine is medium-bodied on the palate and perfectly nice with good fruit and a mildly tannic backbone. I felt it showed a bit of heat, though. It may cellar nicely for 5 to 8 years. I gave it a half-star to one star rating...nice, but not compelling. 5th Place: DOMAINE DE CRISTIA 2003 Chteauneuf-du-Pape "Renaissance"
Though this wine finished in the middle of the pack, the comments made were not especially positive. One person encountered notes of "sweat socks," while another described this as being reminiscent of "wet wool." Someone else used the adjectives of "dirty, Clorox-like, brine, metallic, flat, astringent, licorice and it has a bitter finish." A final taster said the wine was "one dimensional." I noted medium ruby color to this obscure estate's wine. I found a light vanillin note on the palate and some cocoa with a citrus tone and a floral element. The nose was rather pleasant and intriguing to me, more so than it appealed, apparently, to some of the tasters! It's medium+ to full-bodied on the palate. Big, tannic, deep and, at this stage, perhaps a bit unbalanced towards structure as opposed to fruit. Still, I liked it and though I ranked it in fifth place at the end (I had it higher shortly before making my final rankings), I gave it one-and-a-half stars, given my hope it will age longer than many of the wines and blossom into something a bit greater than it shows presently. One taster found "candied notes on the nose and this put me off. It smells sweet." A second person found "sharp and sweet elements." Someone else said "It's not overly tannic." One critic felt "The H2S didn't blow off here. It's ripe and berryish, with notes of cooked plums and artificial cherry notes reminiscent of Kool-Aid." Someone else encountered "Leathery and dusty notes with simple, tobacco-like tones. It's got nice depth and focus." Also sounding a rather positive note was a panel member who found this to "taste like a Chteauneuf-du-Pape. It's showing a lot of Grenache." With medium garnet color, this wine showed lots of fruity elements and some cherry cola notes. I also used the descriptor of "Kool-Aid" in my assessment of the nose, finding the it simple and easy. This wine was the most Beaujolais-like of the set, in terms of aromatics. It's nice and mildly tannic on the palate with good fruit and berry flavors. The wine is far deeper on the palate than you'd expect from its nose. I still wasn't wowed by the wine and didn't award it any stars. Not unpleasant, but sort of Ctes-du-Rhne quality. Probably best in its youth, so drinking this now through 2012 is about right. The nose of this wine was problematic and quite different from how it tasted. One taster succinctly said "It stinks!" Another described it as being "reminiscent of a wet dog." Someone else likened the aromatics to that of "an outhouse. But it changed dramatically." Another taster said "This showed a lot of hydrogen sulfide. Why didn't the winemaker work to clean up this mess? But after the off aromas blew off it showed vanilla bean and some steely notes. It has good flavors, with black cherry fruit and vanilla cream. Frankly, it tastes wonderful. This is a wine that really needs to breathe!" Someone else described this as "having an odd nose with notes of iodine and Brettanomyces." One tasting participant said "I'm not sensitive to any 'off notes' in this wine. I found wood and tobacco tones on the nose and it's great on the palate." 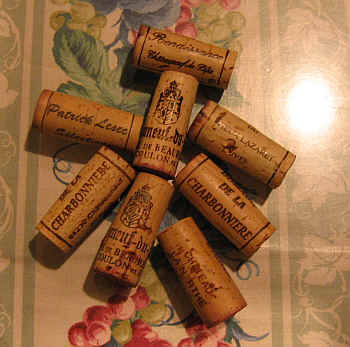 A final critic felt "This was very typical and it's what I expect in a Chteauneuf-du-Pape." Wow...the nose of this started out really stinky, displaying loads of hydrogen sulfide (sort of a rotten egg aroma)! What a stinker!! As the wine sat in the glass, the nose seemed to clean up and I did not find it objectionable. This is a wine which MUST BE DECANTED and left to breathe. I was ready to write off the wine and simply drop it to last place, but when I tasted it, the wine was rather nice. It's big, a bit tannic and shows deep flavors of dark fruit. The wine has good structure and is quite a mouthful...I wonder if every bottle is plagued by the stinky nose? If you can decant this wine an hour or two before dinner, then it's worthy of a one-and-a-half star rating. If not, pass on this one. "Ripe and plummy with toasty notes and some tobacco. It's got depth and focus, but it's quite astringent...overly so." said one critic. Another taster agreed this is "bitter, but it's also more reminiscent of a Northern Rhne than a Chteauneuf-du-Pape." Someone else felt this "is slightly 'new wave' in terms of its style, being all 'tarted up,' but I liked it anyway." Another critic found "black raspberry and mulberry notes. It's 'chewy' on the palate being a mouthful and having firm acidity." Someone else noted "this had the most oak of any of the wines." Medium-dark ruby in color, this wine shows dusty note with some earth and spice tones on the nose. It also had a fragrance reminiscent of pencil shavings at one point. I found the nose rather complex and while it shows some woodsy tones, it was note overtly 'oaky' in character. It's fairly full on the palate and shows a meaty note which made me wonder if it has a substantial contribution from the Mourvdre grape? Deep, dark and full...this is a wonderful bottle of wine! It can be cellared for another 8 to 15 years. Two stars+. One taster had a range of adjectives in describing the winning wine "Rich, cherry fruit, summer savory, baked cobbler, smoked meats, firm tannins and good acidity. Cinnamon and blueberry fruit notes." Someone else felt this was "round and not well-focused." Another person declared it "My favorite wine of the night and the flavors really evolved slowly and beautifully. Yummy!" Another panel member found it "structured," while someone else found it to be "the best made wine of the night. I liked it a lot. It jumped out at me with spicy and creamy tones." I, too, found many positives here. It's medium ruby in color and shows some dusty and faintly leathery notes on the nose. There's a spice tone here, too. Berryish nose. Quite good. Medium-bodied, this is deep on the palate, with nice leathery and earthy elements to its flavor. It's got good length and depth, being a fairly powerful wine. It probably can cellar another 8 to 15 years. One-and-a-half stars+.